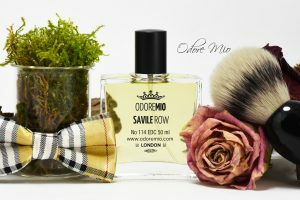 Odore Mio Savile Row is a new take on classic fougere, traditionally gentleman’s bathroom companion scent often associated with shaving, clean white shirts, and a touch of light musk produced by newly shaven skin with soapy undertones. Yes, you will find all these vintage memories in Odore Mio’s Savile Row, but it is a lot more than that. Savile Row is where high end tailors reside in London and where you’d find finest virgin wool, cotton and linen fabrics. These additional aromatic notes have been incorporated here with yet more freshness, spark and gloss to experience. Fresh herbs, freshly cut Cedarwood and Pines, juicy opening with fresh Lime and ripe Red Berry accords provide extra oomph during opening. These will give way to soapy, mossy fougere character later on.